George Clooney and his wife, human rights lawyer Amal Clooney, met with Pope Francis in Vatican City on Sunday as the actor received a medal honoring his work with the pontiff. The famous pair attended the Un Muro o Un Ponte Seminary at Paul VI Hall. The 55-year-old actor won the award for his involvement in the Pope's Scholas Occurrentes, an international organization of the Pontifical Right that connects technology with arts and sports. The "Money Monster" star will serve as an ambassador for one of the foundation's art projects, according to ABC News, which describes Scholas Occurrentes as an organization founded by Pope Francis to bring together children from different backgrounds in hopes of increasing peace and understanding. It works in 82 countries with 400,000 schools and other institutions, the Associated Press reports. 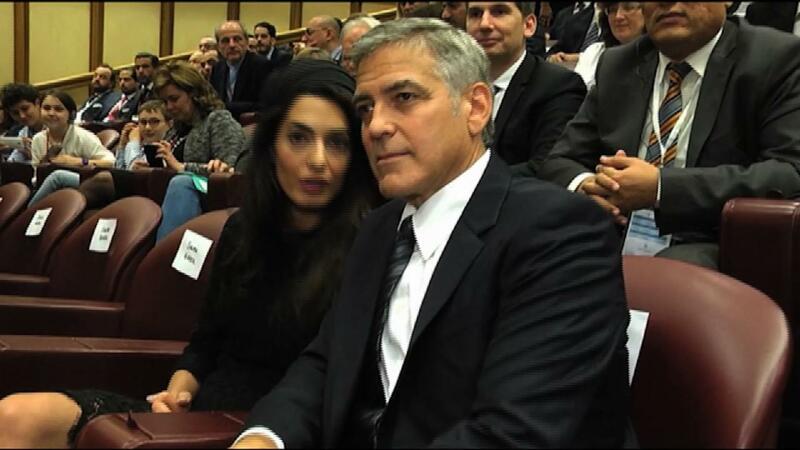 The Clooneys weren't the only emissaries of Hollywood at the Vatican: Actors Salma Hayek and Richard Gere were also at the event and also plan to be ambassadors in the program. Testimonials, music, videos and a question-and-answer session were all part of the event, People reported, citing Vatican Radio. What does one wear to meet the pope? The always fashionable Amal, 38, wore a fitted, lace Atelier Versace dress, turban and Jimmy Choo shoes.